Proving there's no symbolic gesture organizers will skip in their get-tough-on-doping attitude, the Tour will, for the first time in its history, not have a rider wearing the number “1”. Defending champions are generally accorded the honor of wearing the lowest race number, with their teammates getting numbers 2 through 9, but Floyd Landis is out of cycling and fighting a doping ban. ASO will merely skip the single digits, and will assign the numbers 11 through 19 to Oscar Pereiro and his Caisse d'Epargne teammates, and 21 through 29 to CSC. Pereiro was the runner-up at last year's Tour. Tour de France organizers are telling the press that Bjarne Riis has been stricken from the Tour winners list after his admission last month that he used EPO for 6 seasons, including 1996, when he won the Tour. Tour spokesman Philippe Sudres said: "We have removed him from the list because of the doping admission. "We consider philosophically that he can no longer claim to have won." Two issues: 1) A quick look at the official Tour website shows that Riis is right there were he's always been, atop the 1996 Tour. 2) Who, then, deserves the win? Jan Ullrich, who was 2nd in '96 riding alongside Riis at EPO-fueled Telekom? Richard Virenque in 3rd, riding for Festina, which gave us the most scandalous Tour since 1904? The cynic in me wonders if this is a first step toward eventually declaring that the 2006 Tour had no winner. Some Tour officials have already said they don't consider Floyd Landis last year's winner, and now with Oscar Pereiro refusing to take a DNA test to clear up speculation that he's “Urko” in the Operación Puerto athlete files, organizers may prefer to have no winner to having an appointed and controversial winner. While people complain about Phonak's team, I realized there are not just one, but two former Phonak riders leading Landis in the overall standings. Update: CyclingNews had the same thought, and notes that Tadej Valjavec, who was in Rasmussen's early break, also rode for Phonak last year. Oscar Pereiro has been on the attack as much as anybody in this year's Tour. He's like Vinokourov, if Vinokourov could keep his eyes on the prize. He found another break today, alongside Giuseppe Guerini of T-Mobile, Sandy Casar of Française des Jeux, Franco Pellizotti of Liquigas, and a few other strong men, and rode it into the overall top 10. In the day's last 2 kilometers, Guerini launched a blistering assault that none of the others could answer or counter, and rode to T-Mobile's second stage win of the Tour (Vinokourov took Stage 11). The sprinters didn't sleep all day, as Robbie McEwen, Thor Hushovd and Stuart O'Grady led in the field for 14th, 15th and 16th on the stage. McEwen picks up 12 points for the sprint, Hushovd 11, and O'Grady 10. McEwen could take the lead with a win in Paris. Hello, Pereiro; bonjour, Moreau in the overall top 10. Oscar Pereiro was angry about Sunday's stage, where he felt George Hincapie took an unethical win. He took all that anger, clamped it down way inside him, and today, he released all that pressure with a stage win, outsprinting three other breakaway survivors to win in Pau, as the Tour exits the Pyrenees. Ironically, Pereiro could partly credit a long tow from Cadel Evans, hunting a higher overall placing, giving Pereiro, Zandio, and Mazzoleni a chance to recover a bit ahead of the sprint finish. 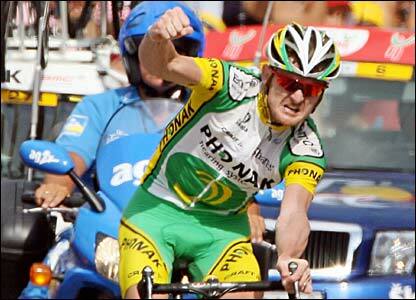 Evans moved up to 7th overall, 4 seconds up on Floyd Landis and 9 seconds ahead of Alexandre Vinokourov. Mazzoleni moves up to 12th, and Pereiro to 15th. 3) Eddy Mazzoleni, Lampre-Caffita, s.t. 4) Cadel Evans, Davitamon-Lotto, s.t. 7) Jorg Ludewig, Gerolsteiner, s.t. 8) Juan Antonio Flecha, Fassa Bortolo, s.t. 9) Ludovic Turpin, AG2R, s.t. 10) Cedric Vasseur, Cofidis, s.t. The leaders' group was at 3:24, followed by a group at 10:05, then at 20:16, and the autobus at 21:33. Interestingly, none of the leaders got any points toward the green jersey competition, so it's still Hushovd at 164, O'Grady at 150, and McEwen at 142. That may have been part of the original impetus for Davitamon-Lotto to send Evans, a teammate of McEwen's, up the road today. Davitamon-Lotto's Cadel Evans, Phonak's Oscar Pereiro, Illes Balears' Xabier Zandio, and Lampre's Eddy Mazzoleni continue to lead the stage. Their gap is 4:05 with 10 k to ride. Behind, the remnants of the early break is around the middle of the gap, about 2 minutes back. That includes Flecha, Serrano, Vasseur, Pineau, and 4 other riders. If Evans keeps his current gap, he'll move up into 7th, ahead of Floyd Landis, but Phonak can't/won't chase with Pereiro, crazy with the smell of a stage win, in the break with Evans. Pereiro has been named most combative for today's stage, so he'll keep the red race numbers tomorrow. Zandio had a bit of a rest earlier, when the break was threatening teammate Mancebo's placing on the GC, so he may be fresher than his three breakmates. Evans is riding for GC, doing most of the pulling. Evans is flying, pumping like a locomotive, with three men team time trialing on his wheel. There goes Mazzoleni, Pereiro slingshots by and gets a good gap! He sits up a little early, but I think he just nipped Zandio for that stage win! Sherwen gets a good line: "I wonder if he'll apologize for sitting on the wheel of Cadel Evans for the last 3 k or so." Field is coming in at 3:25 or so, with (correction) Franco Pellizotti leading in the field sprint. That's going to move Evans well into the Top 10 tonight. Several early probing attacks have gone and been captured. Currently, a 10-man break that includes Saunier Duval-Prodir's Chris Horner, Davitamon-Lotto's Cadel Evans, and Juan Antonio "Never Seen an Attack He Didn't Like" Flecha, is almost 7 minutes in front of the leader's group. Magnus bummer as Magnus Backstedt, who battled over the worst of the Pyrenees over the last two days, didn't take the start. He was 40 seconds inside the time cut yesterday. Also not starting today was Gianluca Bortolami of Lampre-Caffita. Former pro mountain biker Cadel Evans is off the front of his breakaway with about 7 kilometers to climb on the Col d'Aubisque. A number of riders are in between the break and the peloton; notably Oscar Pereiro, still smarting over his 2nd place finish Sunday, and Alexandre Vinokourov. Roberto Heras has hooked up with Alexandre Vinokourov out in front. The peloton is being whittled down to the team leaders. Down to 8 including Landis, Leipheimer, Mancebo, Mayo, Rasmussen, Ullrich, Basso, and (correction) Kaschechkin. Ullrich probes the group, and off drop Leipheimer, Landis, and Mancebo. They've reintegrated, and that group has caught Freddie Rodriguez, who was off the front with Cadel Evans earlier. The gap from Evans all the way back to Armstrong's group is between 5 and 6 minutes, and dropping. Hincapie has caught back up to Armstrong's group. Kashechkin was accidentally hit spot on the nose by a spectator earlier in the stage, and had to get medical treatment for a nosebleed. If he can stay near the lead today, he could take the white jersey tonight; he's second to Popovych by 6 minutes. Hincapie is off the back, Mancebo and Kaschechkin are dropped; the Armstrong group has caught Vinokourov. Armstrong is riding at the front of his group. Vinokourov attacks again! Rasmussen moves to the front for the summit. Armstrong's group catches Chris Horner, they've recaught Vinokourov. Armstrong's group is at 2:53. 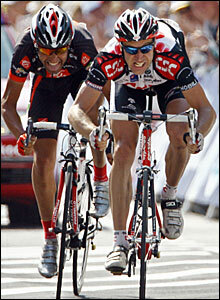 Hincapie is back with Armstrong, as is Popovych, hurting Kashechkin's shot at white. Paul Sherwen reports that Stuart O'Grady is over the descent as the first of the sprinters. There comes Thor Hushovd, so they may get to O'Grady before the day's last sprint or any finishing sprint. On the descent, Oscar Pereiro has caught Cadel Evans, as has Eddy Mazzoleni. Close to 20 riders are now in the group with Armstrong and Ullrich, including a number of Discovery riders, Andreas Klöden, and Roberto Heras. They're riding about 5.5 minutes behind Pereiro. Pereiro flats! He gets a wheel change quickly, and he and Zandio have chased onto Evans and Mazzoleni. Back in the Armstrong group, Horner flats. He should have no trouble catching up, since Armstrong and the 5 Discovery riders are taking it pretty easy. That group has grown to around 50 riders, and Evans/Pereiro/Zandio/Mazzoleni have 6:38 on that group. The day's final intermediate sprint goes to Pereiro. Evans started the day at 12:57 in 11th place, and some of the riders filling out the GC Top 10 are starting to get nervous. Discovery has come off the front, and Credit Agricole, Rabobank, Gerolsteiner, and T-Mobile are putting guys up there to chase the break. If he picked up 6 minutes, he would move ahead of Klöden, Moreau, Vinokourov, Floyd Landis, and Levi Leipheimer, and threaten Mancebo and Ullrich. The chasers have brought the break back down to 4:45 with about 20 kilometers to ride. I'm switching posts for the rest of the stage; check the home page for the new post. George Hincapie took a brilliant stage win on the hardest day of the 2005 Tour de France, climbing away on the ascent of Pla d'Adet. Hincapie, who has ridden with Lance Armstrong in each of his 6 consecutive Tour victories, got his first career stage win in 10 years riding the Tour. He got into a 14-man breakaway with an eye toward being up the road late in the stage to provide Armstrong with some help, and was able to take it easy in the break. When the time came, and the climbers launched attacks to eliminate the break's remnants, Hincapie covered them all, and was left shadowing only Phonak's Oscar Pereiro with the finish line in sight. When Hink wound it up, Pereiro couldn't match the big man's finishing sprint. Hincapie became the 8th American with a stage win, joining Greg Lemond, Davis Phinney, Jeff Pierce, Andy Hampsten, Lance Armstrong, Tyler Hamilton, and Dave Zabriskie. 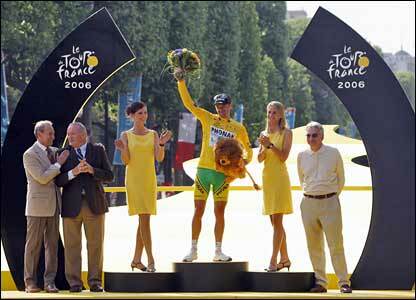 Armstrong held position, finishing with Ivan Basso, and gaining time on every other GC threat. Jan Ullrich lost 1:25 on Basso and Armstrong. Still seeing onesy-twosy reports about how badly people were hurt today. • Tyler Hamilton (Phonak). Dammit. Tyler got caught up in that crash at the end and ended up on his back, where he got some bruises and road rash. Dammit. Good news in that it doesn't appear to be anything serious. Bad news is that he crashed. Again. Dammit. His teammates Oscar Pereiro and Jose Enrique Gutierrez also hit the deck, with Pereiro injuring his hand and Gutierrez scraping up his leg and side. Here's hoping that the injuries are as minor as reported, and that they don't affect the performance of Tyler and his team. Medical reports confirmed that worst off had been René Haselbacher of the Gerolsteiner squad, seen crouched in a foetal position on one side of the road and classified 179th, the last rider on the stage. Haselbacher suffered severe bruising down his left side and was taken to hospital where he was diagnosed with three broken ribs and a broken nose. Haselbacher has abandoned the Tour. Tour rookie Fabian Cancellara of Switzerland took the first Tour de France stage he ever suited up for, beating Lance Armstrong through the 6.1-km prologue by 1.5 seconds. Cancellara, 23, takes the 1st yellow jersey of the 2004 Tour for Alessandro Petacchi's Fassa Bortolo team. Since Cancellara earned both yellow and green jerseys with his ride, Armstrong will start in the unfamiliar green jersey tomorrow. Levi Leipheimer was 13th, Jan Ullrich was 16th, Floyd Landis 17th, Tyler Hamilton 18th, Iban Mayo 26th. In the GC, Armstrong will start with about 15 seconds in hand on Jan Ullrich and 18 seconds on Iban Mayo. Look for Thor Hushovd to wear yellow sometime this week based on his high placing and some time bonuses. Also, it's hard to take Roberto Heras too seriously on GC: He finished 104th, losing about 35 seconds to Armstrong over a 6.1-km course. In the 60-km ITT of Stage 19, that will be several minutes. He told BBC he believes he can take the yellow jersey in the Pyrenees, but even he has some doubts about holding it into Paris. Tyler Hamilton's squad for the Tour de France has been named. The Swiss team will have just one Swiss rider, Martin Elmiger, as they've brought in a talented group, mostly Spanish, to support Hamilton's run at a Tour title. Their reserve rider is Cyril Dessel. Grabsch and Elmiger will be riding in their first Tour. Paris-Nice is probably France's second-biggest stage race, after Le Tour. Sunday's kick-off time trial was won by Jorg Jaksche, the German who joined Team CSC after Tyler Freaking Hamilton left for Phonak. Davide Rebellin of Gerolsteiner and Erik Dekker of Rabobank were 4 seconds back, and Scotland's David Millar of Cofidis was 13 seconds back. 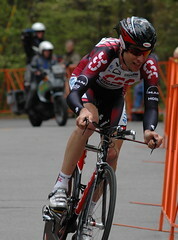 Team CSC also had American Bobby Julich in 7th at 16 seconds, and Jens Voigt, 9th at 22 seconds. "It was important for me to be here with the team. I did OK considering the circumstances," said Hamilton, who finished 29th at 38 seconds slower. "I'm not here with major goals. It's the first race of the season, but I want to get some racing kilometers in my legs and be with the team. If I feel a little better each day, I'll be OK by the end of the week." Instead, Hamilton said he'll support teammates Alex Zülle, who posted a strong ride with sixth at 14 seconds slower, and Spanish rider Oscar Pereiro, who came through 12th at 23 seconds slower. Among the US Postal contingent, Floyd Landis was 19th at 29 seconds, George Hincapie was 25th at 35 seconds, and David Zabriskie and Benjamin Noval were 37th and 38th at 43 seconds back. "I didn't take any risks. I lost more time than I wanted to today so it will be difficult now for the GC," Leipheimer said. Rabobank will likely throw its weight behind Erik Dekker, third at just four seconds back. The 33-year-old veteran is back in top form following two injury-riddled seasons and is extremely motivated to do well here. "I had a good feeling today but I was a little bit unsure because I lost some time in the first climb," Dekker said. "I must have made up the time in the last section. We'll see how things go in the next few days, but I feel good."